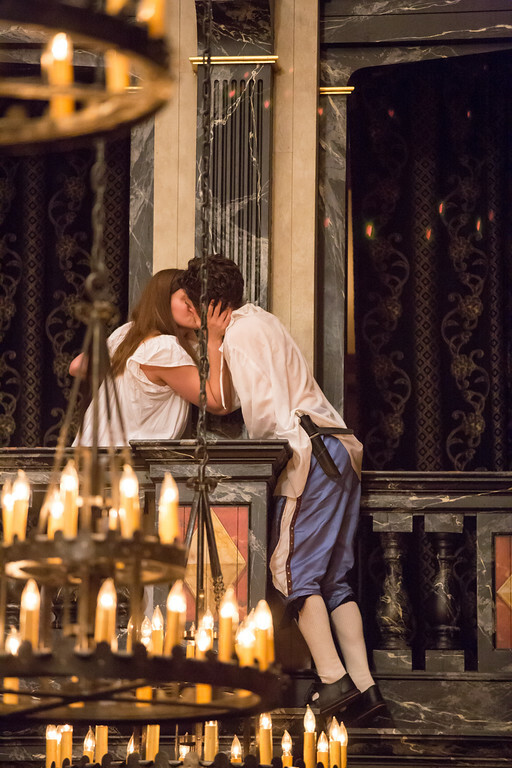 With its ravishing language and uproarious comedy, Romeo and Juliet celebrates love’s triumph and its trivialities. Verona’s walls embrace the volatility of youth as well as the wisdom and restraint that often escapes young and old alike. Thumb-biting, dance, and swordplay share the stage with sonnets, bawdy wit, and soul-searching speeches in this profoundly human and always surprising treasure. Sara J. Griffin and J. C. Long in ROMEO AND JULIET. Photo by TOMMY THOMPSON. 2017. Constance Swain and Josh Clark in ROMEO AND JULIET. Photo by TOMMY THOMPSON. 2017. 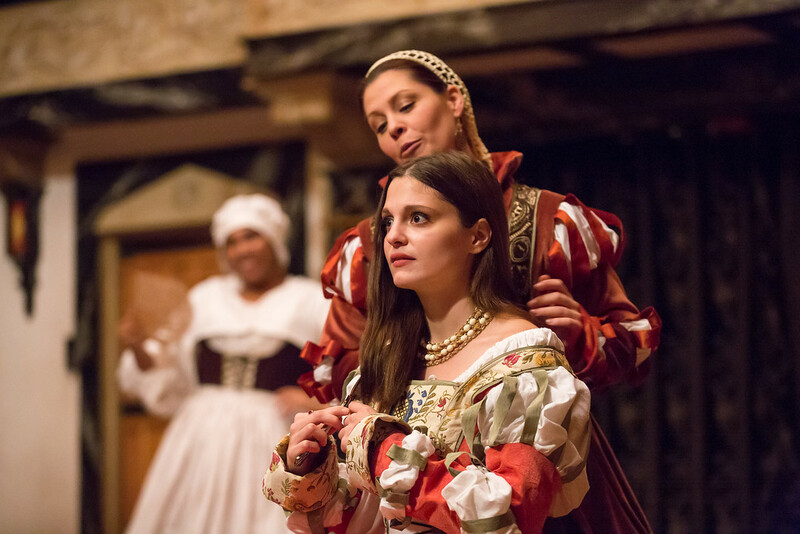 Sara J. Griffin and Zoe Speas in ROMEO AND JULIET. Photo by TOMMY THOMPSON. 2017. Josh Clark, Cordell Cole, and Constance Swain in ROMEO AND JULIET. Photo by TOMMY THOMPSON. 2017. 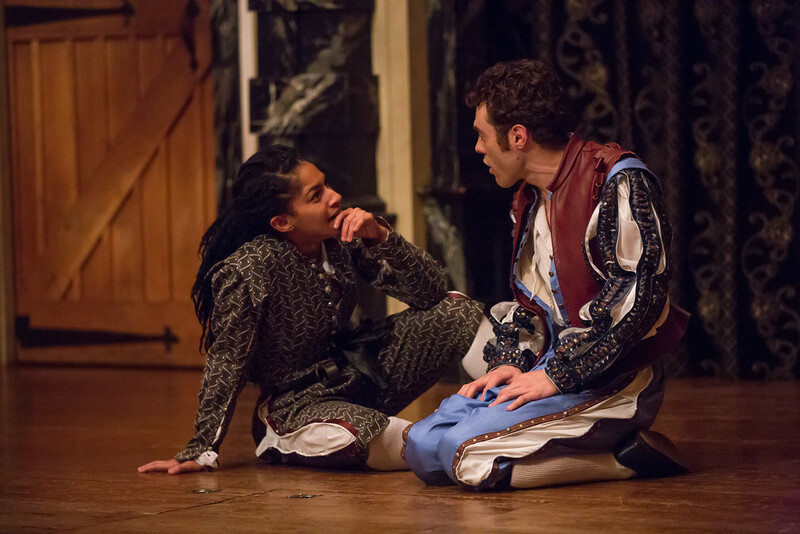 Josh Clark and Zoe Speas in ROMEO AND JULIET. Photo by TOMMY THOMPSON. 2017. Aleca Piper in ROMEO AND JULIET. Photo by TOMMY THOMPSON. 2017. 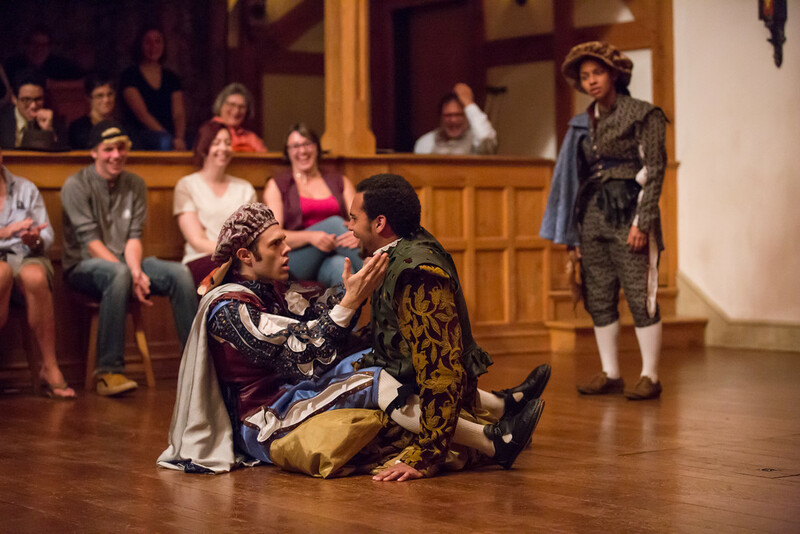 Josh Clark and Andrew Goldwasser in ROMEO AND JULIET. Photo by TOMMY THOMPSON. 2017. Zoe Speas and Josh Clark in ROMEO AND JULIET. Photo by TOMMY THOMPSON. 2017. 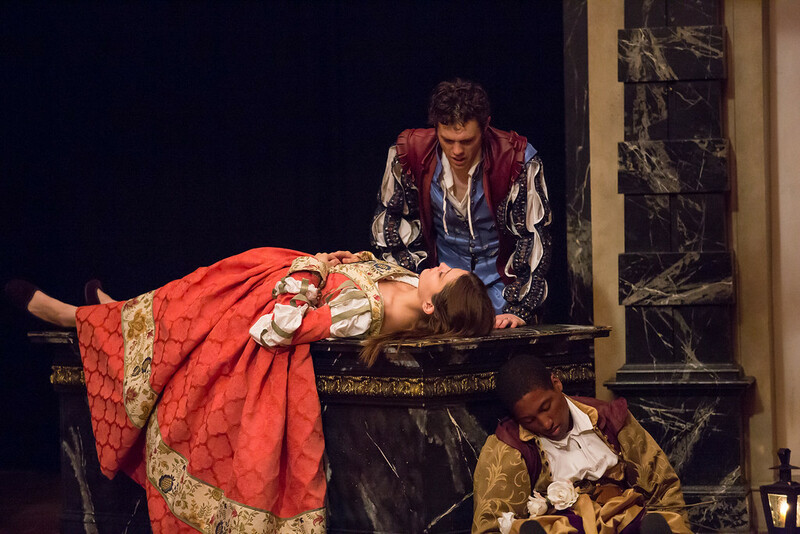 Zoe Speas, Josh Clark, and Kyle Powell in ROMEO AND JULIET. Photo by TOMMY THOMPSON. 2017. 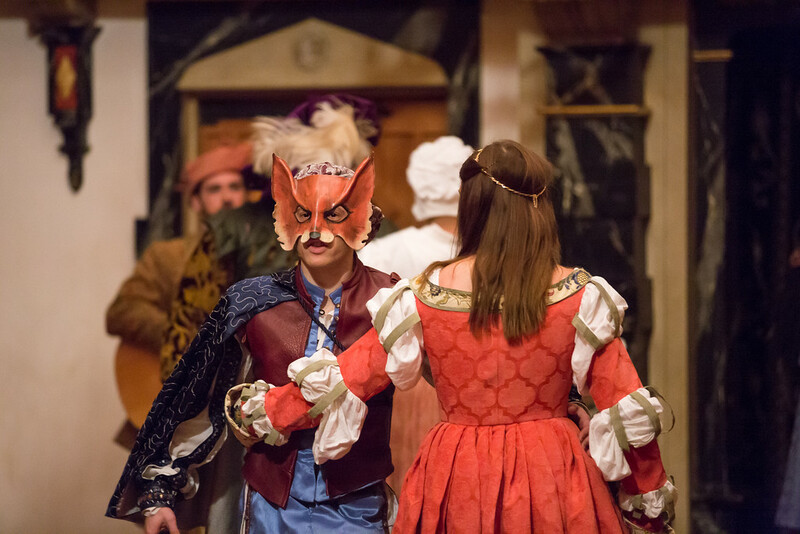 Paris, kinsman to the Prince, wants to marry Juliet, the only child of Capulet; Juliet’s father tells Paris that Juliet is too young to marry but invites Paris to a Capulet party and encourages him to woo his daughter and win her love. The first Shakespeare play in which I ever acted was Romeo and Juliet. As a college freshman knowing next to nothing about the play or really anything about Shakespeare at all, I strolled into the audition where I read for both Friar Lawrence and Romeo, and wound up getting cast in the role of the County Paris. I was frankly very pleased to be playing anyone who had a name, but this particular casting would prove important for a number of reasons. First of all, the production’s passionate (read: tyrannical and somewhat insane) director decided he would play the role of Lord Capulet himself, thus putting my turn as Paris under an extremely critical microscope, as I shared nearly all my scenes with “Doc.” Secondly, and more importantly, it meant that I had to await my first entrance in the wings and watch the play’s incredibly exciting opening scene every night. This experience was to have a lasting effect on me. I thought that was about the most badass thing I had ever heard, and I didn’t need a dictionary or lexicon to understand it in the least. Shakespeare might be the height of western literature, but as far as I was concerned, that line could just as easily come from Cobra Commander as Tybalt. That was exactly twenty years ago, and since then I have appeared in Romeo and Juliet four more times, three of which were here at the American Shakespeare Center. Because of my frequent involvement with this particular play, I wondered, feared even, if I actually had anything new to say with it. I even went so far as to ponder, “Does the world really need another production of Romeo and Juliet?” Sadly, it does. In fact, it is the Shakespeare play that America needs the most. 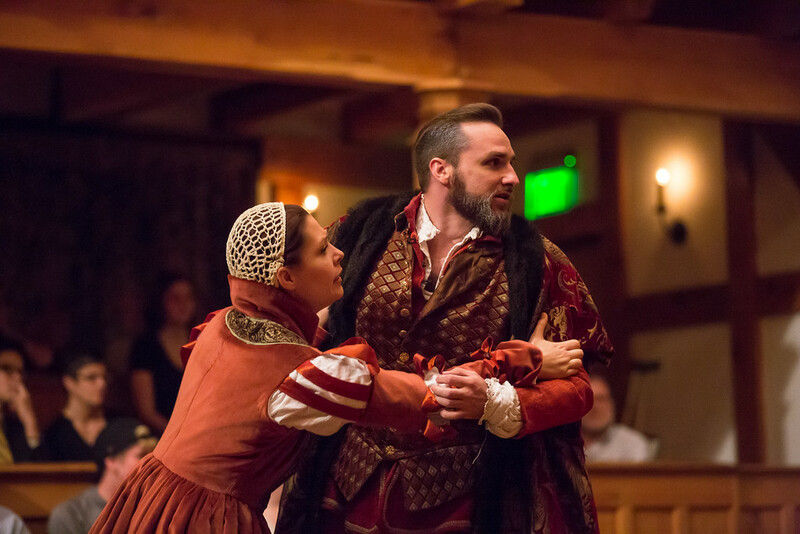 Shakespeare’s Verona, like our own country, is rife with division – division between families, genders, classes, etc. – and also like our own country, it is brimming with violence. 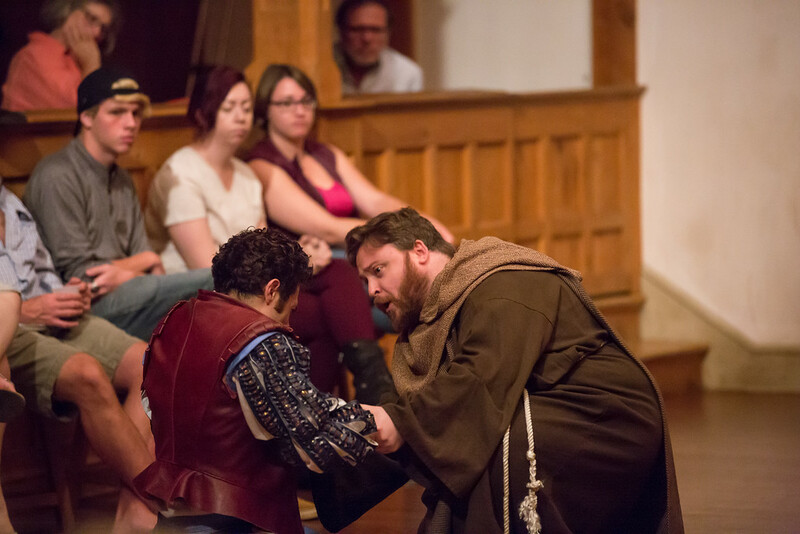 All three families suffer the loss of loved ones throughout the course of the play, but unlike our country, the city of Verona learns something from it. The loss of our titular heroes, who would rather take their own lives together in love than live in a world full of hate, changes the way their families think and act. Their shared loss creates a new community.